So lets get too it, I’m running Snowdon Marathon in five weeks and I keep telling myself that I already have one marathon in the bag and therefore I do not need to worry about training however the truth of the matter is that my weekly miles seem to be getting lower and that’s not because I have started to reduce the runs or distance it is all to do with the time of year. Work got in the way for one week, being up to start a shift at 7am and get home at 10pm with little time to eat during the day apart from grabbing a reduced sandwich is not an ideal routine to go and pound the streets for two hours. The following week I got hit by this flu or cold that seems to be doing the rounds which finally started to pass come Friday which was a stoke of luck as Saturday was race day and the fact that the race is central to the body of this blog entry. So If I had not got better then you would have been saved from reading this dribble. So in short just because I have a marathon and the miles in the legs does not mean i should be cutting back on the training this race was about to prove how much more I need to be doing. Anyway I entered the Great Langdale Half Road Race a couple of months back. I was working in the lakes and had some spare time, one of my work colleagues pointed me in the direction of The Langdale Pikes. For those who have not walked in the Lakes or are like me and prefer (quite rightly I would like to add) the peaks of Snowdon and views of Snowdonia then you should head down to the Langdale valley. It’s beautiful and has some wonderful walking routes, by no mean as good as it’s richer cousin over in Wales but still worth a visit. Now this is the valley that up to last week when I regained my love for Snowdonia had convinced me that the Lake District may in fact be a nice place to hike and when I got back to the office I was informed of a road race around the valley. So on a very warm sunny September morning I lined up at the start of the race ready to embark on it as a training run (in the past I have normally started with this plan and then ended up racing). I had no sense in trying to better my 1hr 41 PB, and I knew if I tried I would die. 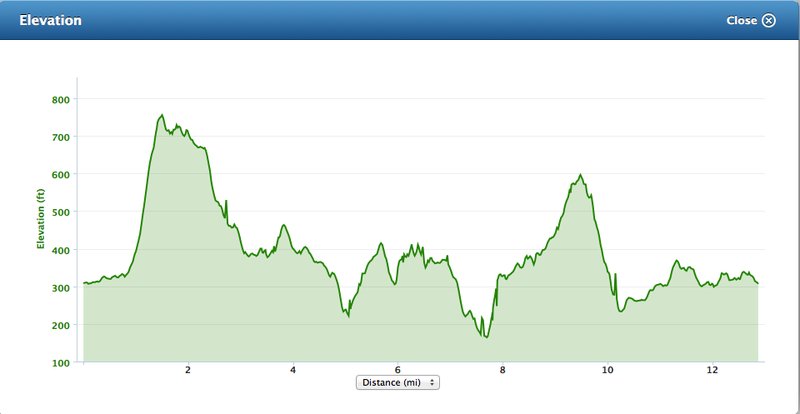 As this course was hilly, and I mean hilly. For those who do not know the area then lets just say its filled with twisty steep gradients, very steep gradients, we’re talking 1 in 3 following and its an undulating course. For those mad enough to run in the Marathon then they had to face the course for a 2nd lap before they could claim their finishers medal. The atmosphere was strong and a large turnout of city folk but also whom I am guessing were fell runners and trail runners from the area, a large number of people were sporting their Braithway T-Shirts (I will explain later) As I was speaking to my friend I noticed that a large assembly of runners were moving off like sheep up the valley to the start, no announcement had been made but people had decided it was time to start running and to stop drinking coffee from the National Trust Pub. The start of the race was a little bit confusing, there was no start line so I was unclear of where to press my button for my Garmin to do it’s work and record quite literally the ‘highs’ and ‘lows’ of the race. The start of the race was a little slow with a pace of 12min a mile, as the marathon and half marathon runners were altogether, it took some time to break free, that and the roads were not closed so had cars blocking the way. It was like this on the whole course, as runners ruled the road and cars had to stop and wait the sheep had been replaced by us mad runners. With the first hill, people had already stopped and were walking and it was not a surprise, it was on the hill section I overheard a man ask about the Braithway. Being on the open road and country single tracks which were not closed to the mechanical beasts, you often heard the cry of ‘Car’ that echoed around the valley and good job too as some of the drivers were speeding round some of the corners. The course never let up, if it wasn’t a steep downhill section it would be up, I can’t think of an area of the course which was flat. After I had crossed the finish line in a rather respectable 1hr 49, which considering the hills, heat and recovery of a cold was good going my mind suddenly turned to Snowdon. Should I pull out? I found this hard and this was just 13.1 miles, and is only a fraction of what will be facing me in five weeks. That question is still being turned over in my mind. For those who enjoy a challenge with your run then this has to be a race to enter the spirit and community amongst runners is second to none and the views are spectacular. The support is thin on the ground but it really is a fantastic run. Well let’s get the day-to-day business out-of-the-way. For the last couple of weeks I’ve been cycling to work followed by training runs once I got home. That is a lot of work for my legs and they were starting to give up on me but I carried on forcing them to work long and hard knowing that they needed the practice if they were ever going to carry me over the line on the Snowdon Marathon. It’s with all the training runs I thought I would try something new, a little tool that has been talked about for years that helps with training… Too spilt up your long runs. Half in the morning and the rest of the distance in the evening. What a wonderful idea and how great it allows you to fit in those other wise long boring runs. You’re still getting the miles in the legs but having a little rest in-between and I can fully recommend running to work and from work it fills you with so much energy and thinking time and its a great work out plus it adds a whole new meaning to running late for work. So you can imagine that over the course of these three weeks, the only rest that my legs got were on Sundays so by the end they were feeling slightly tired. After all they had cycled or ran and many a time completed both of those tasks so when I got an unexpected Thursday off rather than putting my feet up and relaxing I took my legs and headed to the best place on the planet. I had been playing away with the Lakes too much and spent a long time trying to bag myself many of the south and west Wainwrights, I had also been doing the dirty in the Peaks but my beloved Snowdon was once again calling for some attention. The sun was out and the drive was clear, as I drove closer to the border I could see her dominating the landscape and any questions about my love for this place soon faded. Off course I was still in love with her how could I ever have doubted the bond we had. Sure Langdale Pikes are nice and Bowfell is impressive but not as much as the beauty that is Snowdon and all the towns that sit around her, in her wake. Driving through Capel Curig I was once again transported back to when I first remember setting my eyes on her range longing to be walking her terrain and within a matter of minutes I was parking up and putting on the boots. This was going to be a new route, not Pyg or Miners, not even the Llanberis path. No I was going to take in the Horseshoe, over Crib Goch a grade one scramble to the summit followed by a walk along a knife edge for about 2 miles. 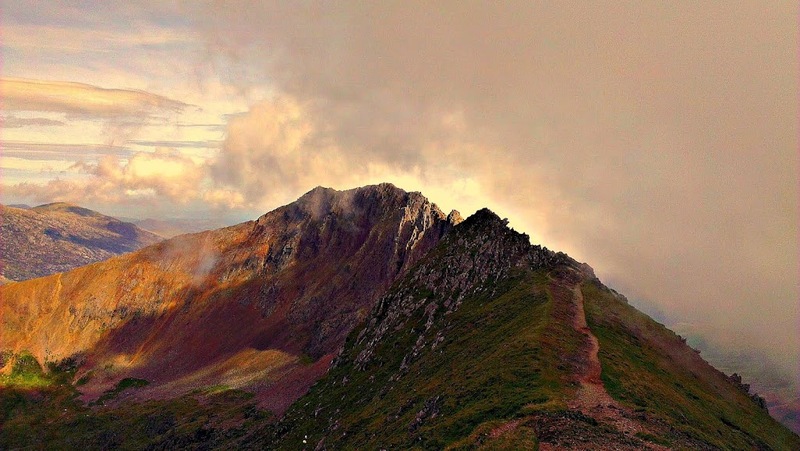 As I climbed the face of Crib Goch my heart was beating like the clappers. One false move one wrong positioning of the foot and I could fall. I could drop, injury myself. It was more like bouldering than scrambling but the fear fueled the excitement the anticipation to achieve this long-awaited goal and as I placed my hand on the top of the rock to pull myself up the view of the real daunting task lay ahead. What was now laid before me was a ridge, a sheer drop to the right with a mere steep rocky slope to the left. 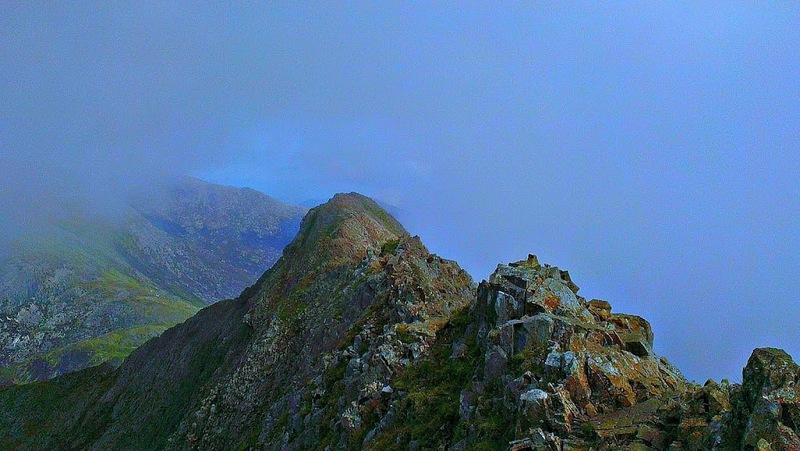 The back of the sleeping dragon seemed to go on for miles with Snowdon waiting at the end. If I thought of turning back now, I would have to carefully navigate myself backwards down the rocks which was no easy task. Onwards it was. If my heart had pumped with fear on the climb up then the walk across was about to make it pop from the rib cage and beat before my very eyes. Within a couple of minutes I had found my footing and eased into the pattern of balancing along the knife edge. The wind started to blow which added another level of danger that wasn’t needed. I got to the end and looked backed. How could I have ever doubted that Snowdonia offer the best for walkers. 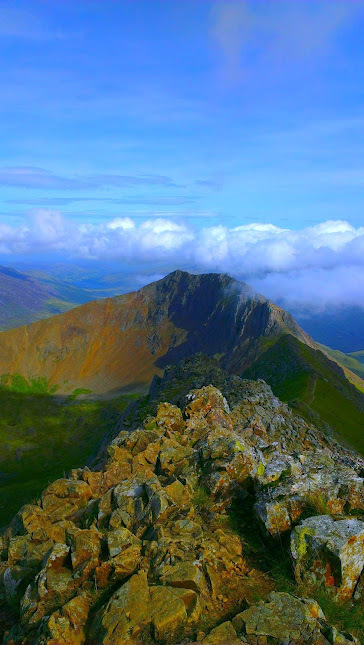 Sure the Peaks are good if you have family, it’s fairly flat, the lakes are good if you want to amble from peak to peak without coming down a mountain to climb another but Snowdonia, Snowdon offers the world and does not disappoint. The easy part of the walk was now to climb to the summit that was now wrapped in cloud once agin I decided to give the gang of tourist a miss and head straight for the cafe to get a cuppa. I’ve climbed the summit so many times now I tend to just walk past it. I find the real views are experienced on the walk up and down. After I had rested and had advised a family on the best way down to the car park I set off. I needed to join the Watkins path for a while and then turn off to climb yet more peaks before heading back to the flat terrain of the Miners route. Watkins turned out not to be Watkins. I somehow think I had turned of the Rangers path a little early but within five minutes I had got back on course with the first section being a lot of scree. Leaving two fellow walkers and their GPS device I was ready to climb my last peak of the day Y Lliwedd while still a slight knife-edge and energetic climb to the ridge walk after the Crib this seemed like a walk in the park but still an exhilarating experience and a far better way to come down from the summit. As I scrambled and played on mother nature’s playground I knew at some point I would have to leave the rock for the dull well-worn and trodden path of the Miners route that escorts you back towards the car park. It was as I was climbing down I saw two fellow walkers. Together we kept company to the car park talking off fell running, climbing and mountains as the day before they had tackled Tryfan for the first time scaling the North face. In my mind I said that the route was good and views were fantastic but Snowdon has, is and will remain my favourite mountain.